Gardens, garages and sheds may contain a number of high value items such as lawnmowers, tools, bicycles and even garden furniture which will appeal to thieves. Gardens, garages and sheds may also contain items like tools and ladders which a burglar can use to break into the house. Householders should check household insurance policies to see if they cover theft from the garden or from any outbuildings on it. Gardens should ideally be surrounded by a well-built brick wall of about 6ft/2m high. 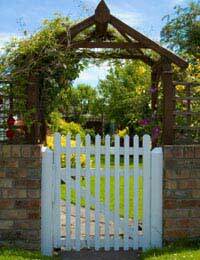 Extra height and security can be added by fixing trellis fencing to the top of the wall. This adds extra height but is not, generally, strong enough to support the weight of a human body so it cannot be climbed. Any side entrance to the property should also be protected by a fence or wall of the same height and any gate should be robust and lockable with an efficient lock. Planting prickly shrubs or trees around the perimeter of a property may be enough to deter most burglars. The use of such plants is far more attractive than some of the more aggressive methods of intruder deterrent, such as barbed wire and broken glass. There is also unlikely to be any legal restriction on their use. If plants or trees are used to act as a natural barrier they must be kept well pruned so that they do not block the view of the property - especially the front door. A burglar trying to break in through the front door will be much happier if he is hidden by overgrown foliage. The police recommend that shrubbery around the front of a property is kept below 3 ft/1m. Gravel is another attractive, but effective, method of discouraging intruders because of the noise it makes when walked on. Security lights make a garden a less appealing place for a would-be burglar to loiter in. Permanent lights will mean that the garden is always lit and may look attractive. The downside of permanent lights is the cost of the electricity and any environmental concerns that householders may have about using energy. Motion-activated security lights that only come on when someone approaches may be a more cost-effective solution and have the added benefit of providing some warning if an intruder does approach the property. Another option is lighting that comes on automatically when it gets dark and goes off again when it gets light in the morning. All types of lights will also give a greater sense of security to people coming home at night or to visitors to the property. Care should be taken that security lights do not cause a nuisance to passers-by or to neighbours. In addition the lights should be placed high enough so that they cannot be broken or disabled by an intruder. Care should be taken that lights are not positioned in such a way that they either blind occupiers when they open the front door or create shadowy areas where intruders could hide. Sheds should be well built and if the wood becomes rotten or glass is broken they should be replaced. If a house is fitted with a burglar alarm coverage could be extended to other buildings such as sheds and garages. Alternatively a separate battery- or mains-powered alarm could be fitted. A door that shuts with a Yale-type lock can easily be opened without the key - a proper mortise deadlock or padlock should be used. Windows should have key-operated locks or be nailed shut if they are never opened. All tools and ladders should be securely locked away when not in use. If they are stored in a shed this must be kept locked. For additional security tools and ladders can also be secured against a wall with a chain when not in use or kept in a lockable steel security box or cabinet. Care should be taken with items like bicycles even when they are left outside the property for a brief period. All items, including garden furniture and ornaments, should be security-marked with the property number and postcode so that, if anything is stolen, it is more likely to be identified and returned. Yes criminals, antisocial people, paedophiles, rapists and any other criminal has the protection of the Criminals in Uniforms. Legal Profession, CPS, Courts, Judges etc, because without criminals none of the above have jobs or salaries, so they need to protect them, make sure they are returning clients, the more they are protected the better and more security of employment all the above. Remember criminals never contact the Criminals in Uniforms, so they like them, but the victims cause the Criminals in Uniforms endless problems, remember all the above would have a great time if the victims never contacted the Criminals in Uniforms, But what above do not understand is, That if we had no victims then the only jobs that all the above would have would be Rat Catching Jobs, and unfortunately we do not have enough rat catching jobs to give all the above security of employment. I have been broken into, my garden via a 6ft wall next to a alley. 3 times in a month.Have had birds stolen damage to property. And I've caught them on CCTV harassing me and trespassing Even the neighbours caught them stealing but yet the police seem powerless.If they don't know the names and last names or recognise them.Even then what will they do just tell them off... They are aged 13-15 yr olds I have nailed down padlocked and secured the best I can.even took birds insideAnd after reading I might aswell give them a written invitation and let them take what they like.. We are not protected as homeowners and we should have no duty to anyone who is entering our property illegally.without invitation.. What has the world come too..
why do people have so many rights when they are the one's damaging and destroying property? what about the rights of honest hard working puplic who have very little available to them to deter trespass who cause damage to property or theft?